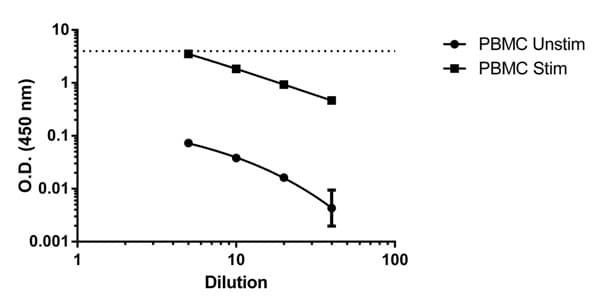 Abcam’s RANTES (CCL5) in vitro SimpleStep ELISA® (Enzyme-Linked Immunosorbent Assay) kit is designed for the quantitative measurement of RANTES protein in human plasma, serum and cell culture supernatant. RANTES (Regulated on Activation, Normal T cell Expressed and Secreted) is a chemotactic cytokine for T cells, eosinophils, and basophils. 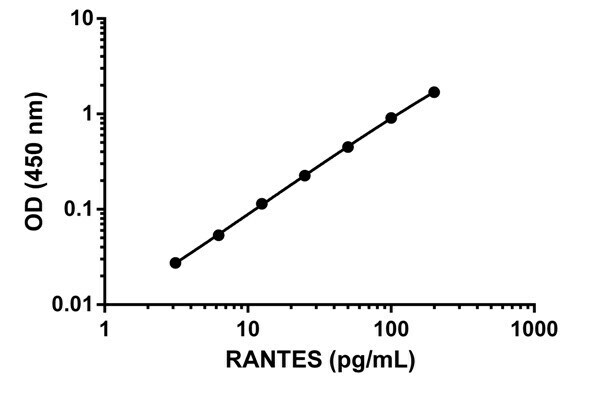 RANTES also acts as a recruitment signal for leukocytes into inflammatory sites with the help of cyotokines (IL-2 and IFN-γ) released by CD8+ T cells. RANTES also activates and induces proliferation of natural-killer cells to form CHAK (CC-Chemokine-activated killer) cells. RANTES has also been identified to inhibit infection of HIV. Our Abpromise guarantee covers the use of ab174446 in the following tested applications. 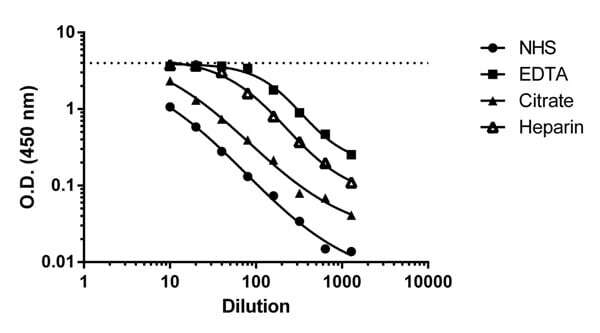 Titration of PBMC Conditioned Media (±PHA) within the working range of the assay. Background subtracted data from duplicate measurements are plotted. Titration of Human Normal Serum (NHS) and Human Plasma Samples (EDTA, Citrate, Heparin) within the working range of the assay. Publishing research using ab174446? Please let us know so that we can cite the reference in this datasheet. There are currently no Customer reviews or Questions for ab174446.